A Custom Shop model paying tribute to one of the finest guitarists of his, or any, generation. Straight out of the case, this guitar feels like you´ve been playing it for 40 years. The way that the finish has been aged looks a little inauthentic when subjected to close scrutiny, but a simple way to remedy that is to get out there and gig the thing hard yourself. Attention to detail. Great neck. Classic Strat sound. Ageing looks a little obvious. The Gallagher fits like an old glove. The Gallgaher comes with five Sperzels and one Grover. Some of the Gallagher's ageing seems a little too precise. Rory's brother Donal took his priceless Fender Stratocaster to LAX airport where the Fender Custom Shop's Mike Eldred took possession of it. Mike, along with John Cruz and John English, then carefully dis-assembled the guitar, examined every facet, measured every detail and Cruz built the original prototype. Only those very close to Rory would know just how much modification had been done to the original guitar, but it was certainly a work in progress. 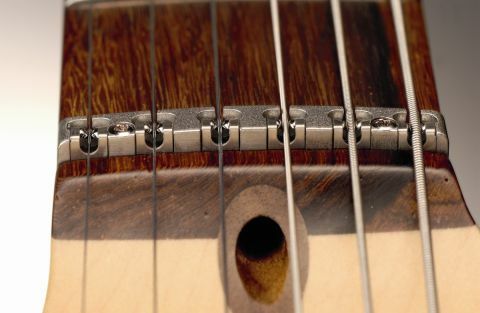 Under the scratchplate, wood had been removed and replaced; the tuners were a mis-matched group of five Sperzels and a Gotoh; one of the 12th-fret 'clay' markers had been replaced by a white plastic dot; the selector switch's mounting screws were flat-heads out of character with the rest of the guitar; the scratchplate was cracked in places; and there are letters scratched into the neck, behind the nut. Essentially this is the Relic to end all Relics, but otherwise it's a stock early sixties-style Strat, with small headstock, three-ply scratchplate, a trio of specially designed single-coil pickups and the original three-way selector switch (not the five-way stated in Fender's spec sheet). The Rory Tribute is made from select alder, while the neck is a sixties-style maple affair with a deliciously dark 'slab' rosewood fingerboard. In places the ageing does look a little affected: the individual 'islands' of sunburst seem too clean-cut around the edges, and where bare wood meets finish at the heel of the neck it seems obviously sanded away. But that's being very picky. In every other sense it's an astonishing piece of work, and even from a couple of feet away is utterly convincing. Silky smooth and drag-free, this guitar also has the modern 9.5-inch fingerboard radius, even though Rory's would originally have been 7.25 inches. This simulates the neck planing that happens when a guitar is refretted - and Rory's had a few of those over the years! These large frets help you to squeeze every ounce of feel from the guitar, and you rarely miss the extra fret of the other models. The Rory fits like an old glove, and feels like you've been playing it for 40 years. The Gallagher is resonant and open-sounding when played acoustically, and this translates into a dynamic musicality when plugged in. The low-output pickups echo the authentic voice of genuine vintage units, but there's a twang here that's often lost as a guitar ages. Through a mildly driven Marshall, the guitar's raison d'etre becomes quickly apparent: to milk the thing for all it's worth, pulling - as Rory did - every ounce of tone from every winding. Rory was a treble pickup man and this one is wiry and musical, but flip to the middle or neck - or lodge the three-way between settings - and each sound is right in its expected ballpark. This guitar is a fabulous player that sounds close to the genuine article. Even though some of the ageing seems a little obvious, this is a guitar that will elicit gasps of astonishment as you lift it from its case.